At least one tenant for Easton’s proposed intermodal center is signed for what passes for perpetuity these days — 99 years. City Council approved a master lease Wednesday night for the yet-to-be-built intermodal, inking the Lehigh and Northampton Transportation Authority to a long-term deal in return for an upfront payment of $7.2 million. The lease with LANTA is through the city’s parking authority, which in turn will operate the 370-space parking deck and bus terminal portion of the project. LANTA’s cash payment, derived from a federal transportation grant, is a major source of funding for the $26 million intermodal. Easton Mayor Sal Panto Jr. hopes to couple the LANTA money with grants obtained by the city to cut the amount the city must borrow to no more than $13 million. Site work for the project started last year after the city demolished a Perkins restaurant and a movie theater on S. Third St. Construction could begin this summer. Pittsburgh’s controversial North Shore Connector project has passed the 80% completion mark. The project is on time and the $528 million dollar budget is on track! When the project is completed, Port Authority Transit (PAT) will be able to reach the three sports stadiums, museums, a casino and other North Side businesses through two twin tunnels that were bored 22 feet below the Allegheny River. The “T”, Pittsburgh’s light-rail system and subway, will leave the Golden Triangle, go under the river and come up on the North Shore. This means that all those sports fans, concert goers, museum goers, gamblers, shoppers and diners can park their cars and use mass transit to glide through Pittsburgh to their destination. Being from Pittsburgh and having used mass transit there extensively, including the “T”, I think this will make life so much easier. Sitting on 376, stuck in the Squirrel Hill Tunnel waiting for traffic to move ain’t pretty. I have sat inside the Squirrel Hill tunnel many times going downtown for a game, shopping, or just trying to cross Pittsburgh during rush hour. Thank goodness I am not claustrophobic. Tunnels are a way of life in Pittsburgh! The Liberty Tubes and the Fort Pitt Tunnel are also pretty unavoidable and back up as well. 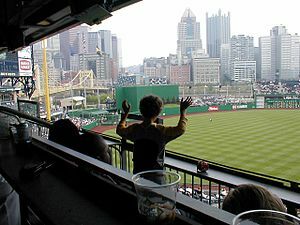 For example, it would be nice to ride from the South Hills all the way to PNC Park on PAT. No parking worries and not being stuck in traffic! While this project has its detractors and has been labeled a gigantic waste of money, hopefully once Pittsburgers are able to use this extension and reap the benefits from it, time will show it was a good thing. I would most definitely use it! If you have been downtown lately, you will notice there is construction going on next to Harleysville Bank First Niagara Bank. The old SEPTA train platform area is being renovated and transformed into an intermodal transportation center. This is a much-needed improvement for Pottstown. Currently, PART’s main transfer point is right in front of Argento’s restaurant and in the middle of the very busy High & Hanover Street intersection. Those big buses take up a lot of room! Wisely, our borough government has applied for and been awarded a grant from the American Recovery and Reinvestment Act to create the intermodal transportation center. A transportation center makes SENSE! If you have ever been to Norristown’s transportation center you will see how organized this makes using mass transit. 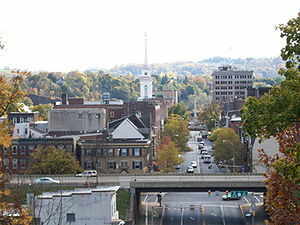 Pottstown is unique as we are the only municipality in Montgomery County to have our own mass transit system. Pottstown also has SEPTA service along with PART. As I am constantly posting and hinting around about Pottstown getting grants to pay for improvements, I feel it is only fair that we give public recognition to the borough for obtaining one! Nice going and let’s get some more :).